Hello everyone! Summer finally arrived in the Upper Midwest, and boy, did it show up with a vengeance! Those living nearby probably don’t want to hear more about just how miserable the weather is, but for those of you in distant lands, the heat index has been flirting with 120 degrees here all week. I’m seriously starting to look forward to a nice winter snow storm…which will probably be only a few months away. Ahhh… Minnesota. So where have I been, you ask? Well, we’ve had a busy July. As you know, I took the kids to North Dakota to visit family. We had such a great time seeing everyone. Shortly after we got back, we took our first trip to the world-famous Wisconsin Dells. It was so much fun, and so cheesy (Wisconsin pun intended). Waterslides, go-cart racing, food, a tour down the river on some sort of World War II vehicle. Our kids are still talking about the trip. They want to go back right away. Now that you’ve had the family update, let’s talk food again. Wow! Do I have some exciting things to share with you! 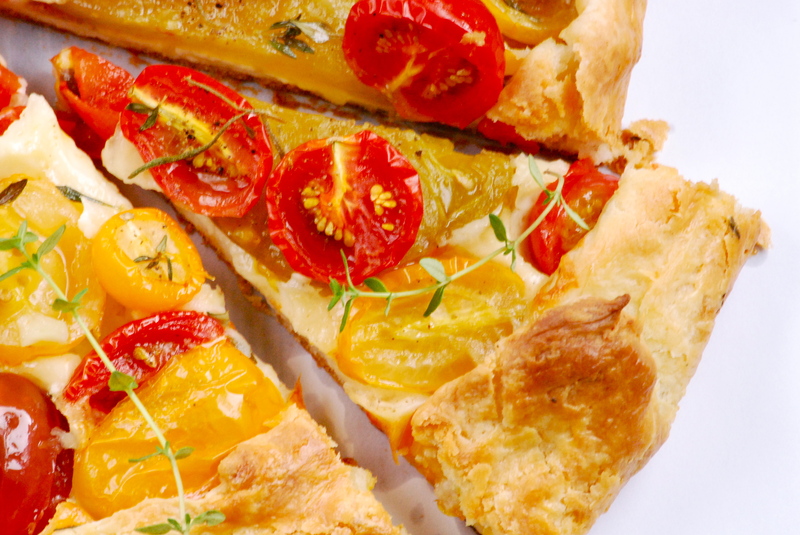 Let’s start today with this gorgeous heirloom tomato galette. You know I love fresh tomatoes, but are you aware that I’m that slightly-crazy person who refuses to buy one all winter long? More than any other vegetable (cucumbers are a close second), tomatoes purchased out of season and shipped in simply do not taste the same. Not even close. Thankfully, they’re in-season now, so you can expect to see several more tomato-based dishes in the coming weeks. This show-stopper of a tart is the perfect way to feature the pure flavor of ripe tomatoes. I’ve been waiting to make this recipe for awhile– not only because it looks incredible– but because it’s the creation of chef/owner Naomi Pomeroy from the fabulous restaurant Beast in Portland, OR. Last October, Radd and I vacationed in the Pacific Northwest and stumbled into Beast– a communal-style locavore paradise. We shared a table and company with six strangers. The food was divine, and it was easily one of the best dining experiences I’ve ever had. When I saw that this tart came from Beast, I knew I had to make it. So how is it? Better than you can imagine. When I showed Radd, he thought it looked great, but he wasn’t exactly fired-up to try it. After his third piece, he said it was one of the best things he’s eaten in a long, long time. The crust is so delicate and flakey. The manchego cheese adds a creaminess that perfectly compliments the acidity of the tomatoes. Finally, the olive oil and herbs provide subtle complexity– the flavor really goes on and on. It’s delicious warm, but even better at room temperature. If you make only one savory dish from my blog over the next couple of weeks, it should be this one. It’s that good. To make the dough: Combine the flour, salt, baking powder, and 1 teaspoon of minced herbs in a food processor and pulse a few times to mix. Then add the butter and pulse until the butter is just incorporated into the dry ingredients, making sure not to over-mix. Some of the butter may be the size of a pea, which is fine. This can also be done by hand if you don’t have a food processor. Mix in the sour cream, being careful, once again, not to over-mix. Turn the entire mixture out onto a cutting board and gently push it together into a ball. Wrap it tightly with plastic wrap and refrigerate for 2 hours. To make the filling: Put the tomatoes in a colander and sprinkle generously with coarse salt. Lay the tomatoes on several sheets of paper towel to drain (dried tomatoes will make a crisp tart). In the meantime: Heat the oven to 425°F. Lay out a sheet of parchment paper that will fit onto your baking sheet. Dust it with flour, as well as your rolling pin, and roll the dough out to a 12-inch circle about 1/8 – inch thick. Leaving a 3 -inch border, scatter the cheese on the top of the dough, then arrange the tomatoes evenly over the cheese. Sprinkle with a bit more thyme and rosemary. 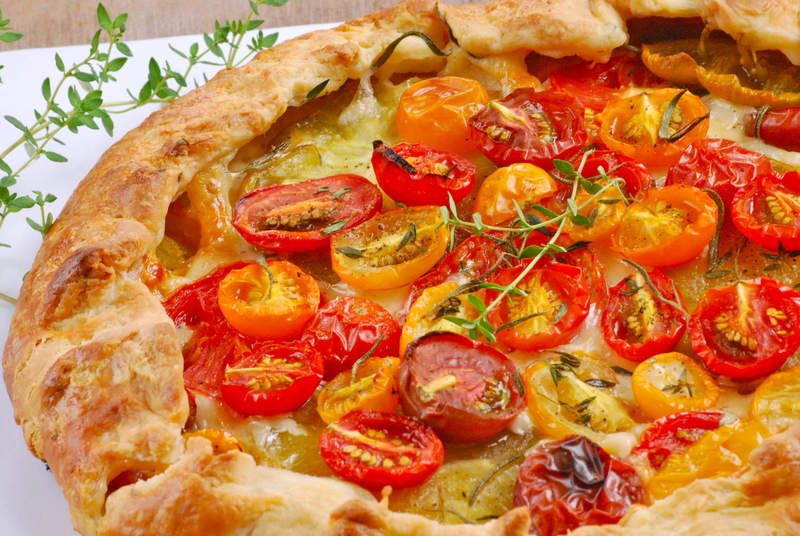 Fold the edges of the dough over the tomatoes, making pleats as you fold and leaving the center of the tart open. Make sure there are no holes in the dough; pinch the dough together if one appears. Whisk the egg white and apply to the tart dough with a pastry brush or paper towel. Transfer the tart with parchment paper still underneath to a baking sheet. Bake the galette until golden brown, 30 -40 minutes. Let cool on rack. While the galette cools, lightly dress the microgreens with the olive oil, vinegar and salt. Drizzle the top of the galette with olive oil and sprinkle it with course salt. 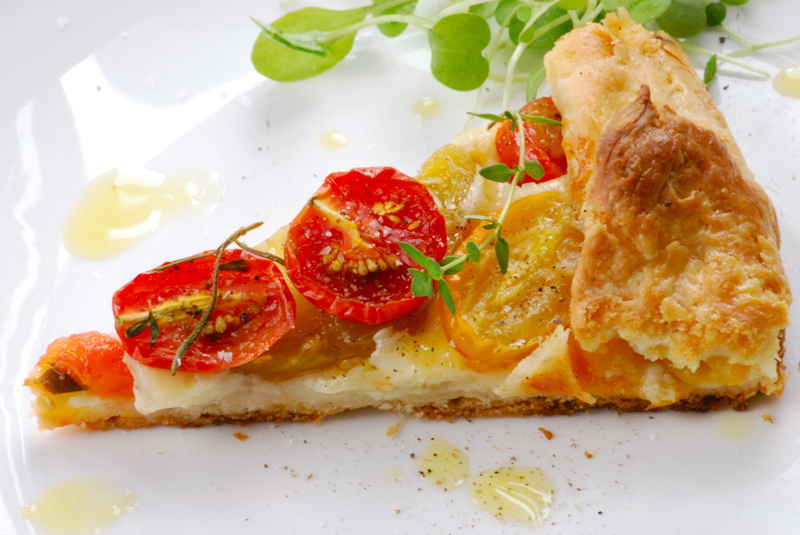 Slice the galette and serve with microgreens, of desired. Enjoy! Thanks for visiting Relishing It today! Hope you are all enjoying your summer. See you soon. Looks so gorgeous Laurie! 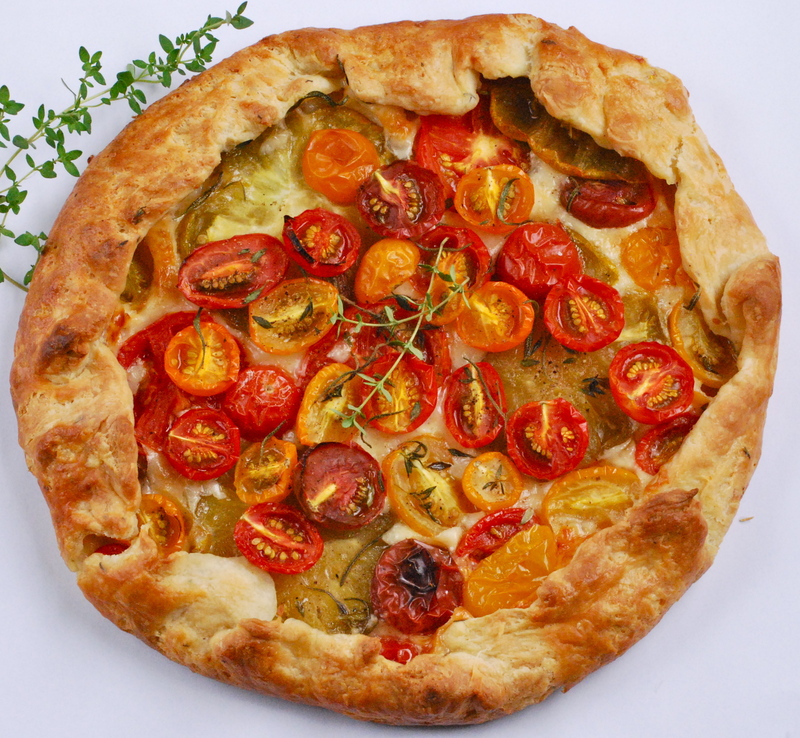 I love a good savoury galette/tart/what have you and this looks so on the money! I agree with 100% about tomatoes out of season as well. I won’t touch them outside of summer but right now they are fabulous! Thanks for the sweet comment, Angharad. I’m already thinking of making this one again. So easy and so delicious. 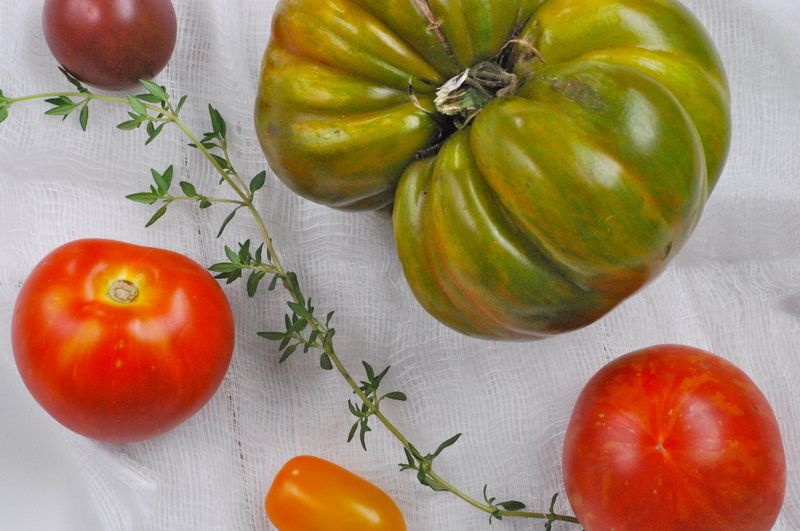 Ahhh…..tomatoes! That is a beautiful galette! I, too, refuse to buy mealy winter tomatoes. My CSA had our first tomatoes of the season today and I ate them all without a trace or regret. Once they’re falling off the tables at the market, I will earmark some for galette-dom. I’m a Portlander myself so I am so excited to get out to the farmers’ market Saturday to nab some tomatoes for this dish! One thing though – how did you ever get a seat at Beast without a reservation?? You must have some crazy timing voodoo up your sleeve! Hi Katy! We love your city — we still reminisce about it often! We were unbelievably lucky that there were two open spots at Beast when we walked in — we were famished from traveling. We were celebrating our anniversary and as luck would have it, so were the other three couples at our table. Wonderful food and and unforgettable night with new friends. Just made this today with gorgeous farmer’s market heirloom tomatoes. It was fabulous! I loved the rich, sweet taste the tomatoes develop. Also, I used white sharp cheddar cheese instead of manchego, which worked well. This recipe is awesome! The dough is perfect, the combination of manchego, heirlooms and thyme is perfect, and it takes half the time you’d expect! I followed the directions exactly and I’m proud to say its the flakiest pastry I’ve ever created. My boyfriend will continue to reference “that French pizza” forever!